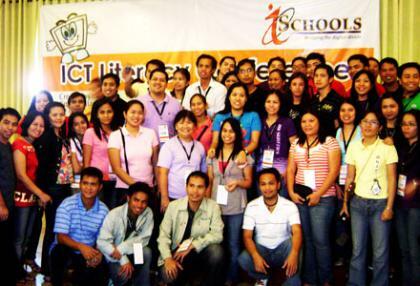 Manila (2 August) -- As part of its continuous efforts to standardize guidelines that govern the conduct of its numerous ICT training activities, the iSchools Training Component will release a User's Manual to aid public high school teachers to conduct an orderly and systematic ICT Literacy training. Drafting the manual was an off-shoot of workshop outputs of participants to the ICT Literacy Conference for Teachers held at the Crown Royale Hotel in the City of Balanga, Bataan last July 2 to 5, 2010. Bataan Peninsula State University, a staunch State University and College (SUC) partner of the iSchools Project, hosted the activity. There were at least 218 participants coming from a mixture of partner SUC and public high schools, who gathered to contribute various inputs on how to help teachers create and discuss lessons on the basics of computer and internet operations using stable Free and Open Source Software. Various lessons on specific computer operations and applications were categorized according to their difficulty. The basic, intermediate and advanced distinctions would help trainers identify which lessons best fit the different needs and abilities of their learners. These are just some of the major parts of the manual that will be released next month in time for the rollout of ICT Literacy Training for Teachers of public high schools. Once completed the User's Manual on ICT Literacy will be used to train roughly 6,400 teachers from the 320 recipient schools nationwide. After the conference, some participants who possess skills in technical writing were requested to stay for two more days to get involved in a write shop organized by the iSchools Project. These participants were tasked to polish the workshop outputs produced by their fellow participants. These writers were actually recipients of numerous basic and advanced online and offline content management training conducted by the Content Development Unit of the iSchools Project. They were Gilbert Andaluz of the South Luzon State University, Theda Flare Quilala of the Tarlac State University, Adette Lelina of the Eastern Visayas State University and Mayci Rodriguez of the Western Mindanao State University. They were joined by some iSchool staff such as Bambi Torrecampo, CP Calma and Joed Alcid who took part in the write-up and editing stages of the User's Manual. An innovation in this year's Manuals was that the learning activities were designed to recreate actual tasks done by teachers, such as creating class records, enrollment reports and even lecture presentations. This improvement was founded on iSchools' thrust of bridging the digital divide by employing ICT in education. "Hopefully this effort," shares iSchools Project Manager Toni Torres, "will allow teachers to appreciate the convenience ICT brings to their daily functions as educators and classroom administrators." The iSchools Project is one of the flagship projects of the Commission on Information and Communications Technology (CICT) under the ICT4BE Program. 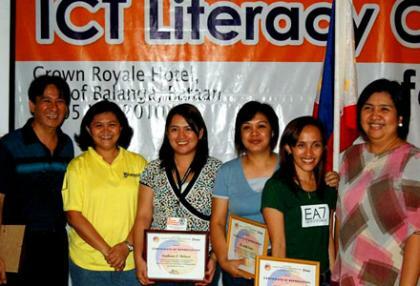 Recognized at the 2009 Philippine Government ICT Awards and the 3rd Government Technology Awards in Bali, Indonesia, the project aims to integrate Information and Communication Technology (ICT) in education, by providing training modules and increasing ICT access in public high schools. 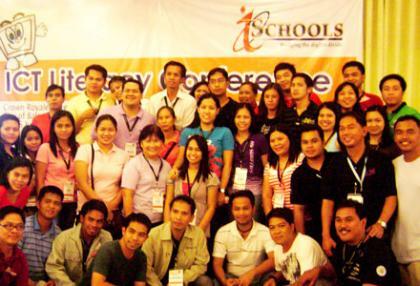 This makes it the most comprehensive ICT-for-education initiative of its kind in the Philippines. Now on its 4th year of implementation, the iSchools Project would have provided these services to 1,000 public high schools nationwide.